This exhibition explored the history and development of photography in Guatemala in over 100 images, from temples to plantations, travelers to politicians, soldiers to families. The almost completely unknown wealth of images in Picturing Guatemala also offered an exhilarating view of over 120 years of the nation’s cultural history. 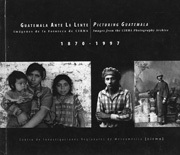 It was the first survey of Guatemalan photography to be presented in the United States.